Valentine's Day crafts are perfect for children to demonstrate their love, appreciation, and friendship! Red, pink, and white waxed crayons, wooden crayons, and markers, add red food coloring to a few containers of glue, a small container filled with metallic confetti, Valentine's Day stickers (hearts, cupids), red, pink, and white feathers, all kinds of red, pink, and white paper (tissue paper, crepe paper, metallic paper, cellophane). Slide red, pink, and white beads onto a pipe cleaner. Shape it to look like a heart. (Open Valentine's Day stained glass) Trace and cut out the shapes f you want to work with in cardboard. Keep only the contour of each shape. Glue a piece of cellophane paper on the cardboard. Glue sparkles around the edges of the cardboard. Display in a window. (Open craft-Heart caterpillar) Print. Children cut out the hearts and glue them together, overlapping them to form a caterpillar. Use a fastener to attach the caterpillar's head so it can move. (Open Valentine's Day garland) Cut out the models. Trace the model of your choice on folded sheets of paper (paper must be folded several times). Cut out the shape making sure not to cut the sides so that when you unfold the paper, the shapes remain attached. (Open craft-Valentine's Day shapes) Print and cut the shapes out of colourful construction paper. Glue sparkles and glitter on both sides. Glue strips of tissue paper on the tips of the shapes. Punch a hole in each shape and thread string through. Cross two wooden skewers and hold them in position with thread. Attach the shapes to the ends of the skewers and one in the center. Trace the outline of a heart and cut it out. For the butterfly's body, glue several tiny hearts vertically. Children may decorate their butterfly, adding eyes and antennae. Trace and cut a heart out of cardboard. Keep only the contour. Glue a sheet of adhesive paper (Mac-Tac) over the cardboard. Glue several different colors of tissue paper (tiny pieces) in the heart. Display in a window. Trace a heart onto black construction paper. Fill the heart with glue. Crumple tiny peices of red, pink, and white tissue paper and use them to fill the heart. (Open craft-heart shape) Print the hearts and trace them on the paper of your choice. Let children decorate their hearts with crumpled pieces of tissue paper, sparkles, etc. (Open craft-heart shape) Print, cut out, and glue the hearts on a string. Use red, pink, and white paper. Cut out several pink hearts. Cut a slit in each heart and insert a drinking straw. (Open craft-Lovely butterfly) Print and cut out. For the butterfly's body, use an empty toilet paper roll. Have children color it using waxed crayons. For the wings, glue the heart shapes to the back of the toilet paper roll, pointing inwards. Punch two holes and thread a pipe cleaner through them for the antennae. Cut hearts out of all kinds of paper: flyers, wrapping paper, red metallic tape, etc. Glue them onto a large sheet of paper. Add the child's picture in the center of one of the hearts. Laminate the placemat. (Open craft-heart with two legs) Print. Have children color the pieces and cut them out. The large heart is for the head and the body. Make accordions with strips of red paper for the arms and legs. The medium-sized hearts are to be glued to the arms and legs to represent hands and feet. Trace and cut out various sizes of hearts. (Open craft-heart shape) Decorate the hearts with bits of lace, ribbon, cotton balls, sparkles, etc. Glue the hearts on either side of ribbon or string (back to back). Hang from the ceiling. Trace a heart on black construction paper. Fill the heart shape with glue. Crumple tiny pieces of red, pink, and white construction paper and use them to fill the heart shape. (Open lacing-heart with holes) Print, laminate, and cut out. Punch holes around the contour of the heart. Lace the heart with a string or ribbon. Make a beautiful bow with the ends. Give each child a small cardboard heart with a hole punched in the top so it can be worn as a necklace. Spread glue over the heart and sprinkle it with sugar. Once dry, you will have a sweet pendant. Cut a cardboard strip out for each child making sure it is long enough to wrap around their head. Decorate the headband. Use the top of a frozen juice can. Apply glue and add glitter, red, pink, and white beads, etc. Let dry. Once completely dry, attach a pin to the back with hot glue. Cut an empty toilet paper roll into several small rings. Make an incision in each ring. Let children decorate their bracelets. (Open craft-jewellery models) Cut a 2 cm strip of construction paper for each child. Adjust to fit children's wrists. With glue, layer the hearts on the strip of construction paper, alternating colors. (Open craft-Valentine's Day crown) Print several copies. Color, paint, and cut out. Measure each child's head and use stap les to form a headband. (Open Valentine's Day medals) Print and cut out the models. Each child colors his own medal. Laminate using Mac-Tac. Make a hole with a hole-punch and thread a piece of yarn or pretty ribbon through it. Children will love wearing their Valentine's Day medals around their neck. Make Valentine's Day glasses. Use two small yogurt containers ("Minigo"). Cut hearts out of the bottoms and cover them with red acetate paper. Punch holes on the outside edges and insert two pipe cleaners. Shape the pipe cleaners so children can secure them on their ears. Attach the two containers together using a small piece of pipe cleaner. 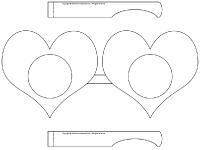 (Open craft-heart glasses) Print the model and trace it onto heavy cardboard. Cut out the interior portion of the hearts and add pink or red cellophane paper. Use an empty baby food jar. Coat it with glue and add sequins. Glue the picture of the child on the lid. Fill the jar with tiny chocolates. Add red, pink, or white ribbon. Decorate a lunch bag by gluing hearts, sequins, or other decorative elements on it. Children place the gift they make for their parents inside. Use two paper plates per child. Round off the tops of the plates to give them a heart shape. Punch holes around the contour of both plates and thread red, pink, or white yarn through the holes. Decorate the plates. Fill the candy box with candy or chocolate. You may also use it as a Valentine's Day mailbox. Give each child a piece of an old lace curtain. Deposit pot-pourri inside and tie a knot with pretty red or pink ribbon to hold it together. Cut two identical hearts out of felt and sew them together, leaving a small opening. Fill with pot-pourri and sew shut. Cut an empty toilet paper roll in rounds. Decorate them with Valentine's Day colors. Use as napkin rings. 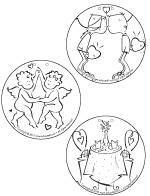 (Open models-Valentine's Day napkin rings) Print and cut out. Decorate with stickers and glitter. Make incisions in the ends and slide them one inside the other. Use as napkin rings. Provide each child with a wooden clothespin. Have them paint it red. Let dry. 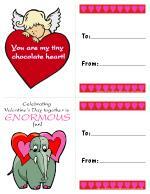 (Open models-Valentine's Day place cards) Print and trace the models onto construction paper, then cut them out. Children glue the shape of their choice on the clothespin. Attach the clothespin to a Valentine's Day napkin. (Open Valentine's Day frame) Print and glue onto cardboard. Cut out the centre and attach a picture from behind. Decorate a Styrofoam glass by gluing cardboard hearts on it. Punch holes on either side of the glass and thread a pipe cleaner through to make a handle. Fill your basket with candy and chocolates. (Open craft - decorative box) Print and trace the model on construction paper (one per child). Cut out and assemble as indicated. Let children decorate the box as they wish and deposit cookies inside. Children will love presenting their parents with the cookie box. Add decorative ribbon. (Open craft - Heart shape) Use the model to trace two hearts per child on felt. Punch holes around the contour of the hearts using a hole-punch. Children can thread yarn through the holes to close the heart. Before closing it completely, add pot-pourri. Continue lacing and make a knot to hold everything together. Children will love offering their scented heart to their parents. Cut the top off of a 1 or 2-litre milk container. Paint the entire surface or cover it with construction paper, leaving the top uncovered. Add glue, glitter, and tiny hearts. Add a handle by stapling ribbon on either side of the container. Children deposit their gift inside their gift bag and add tissue paper. Give each child an old shoebox. Let them paint it or cover it with Valentine's Day paper. They can use the gift box to offer a gift they made for their parents. (Open craft-Heart shape) Print and cut out the heart shapes. On colourful cardboard, assemble the hearts by joining the points, creating a larger heart shape. Children apply lipstick and kiss a piece of cardboard. They can use their "kiss" to make a beautiful Valentine's Day card. Variation: The kiss could be in the centre of a heart children have drawn or a lace heart. Decorate an empty Kleenex box and use it to collect Valentines. Use cardboard. Add drops of red, pink, and white paint. Blow on the paint using a straw to spread the paint in every direction. Dip heart-shaped cookie cutters in glue and make prints on a sheet of paper. Sprinkle with glitter. Cut a heart out of cardboard and let children add stickers to it. Cut out two identical hearts in Mac-Tac. Decorate a heart (sticky side) with crumpled tissue paper, sequins, dried flowers, etc. Place the other heart on top. Cut two identical hearts out of waxed paper. Prepare a mixture of corn syrup and red food coloring. Paint one heart with this mixture and place the second heart on top. Let dry. Hang from the ceiling or in a window. Have children choose a piece of red or pink tissue paper. Trace a heart for them and have them cut it out. Place the heart in the centre of a white sheet of paper. Wet a paintbrush with water and gently apply the water over the tissue paper. Gently remove the tissue paper. The ink from the tissue paper will have run onto the white paper. Prepare Jell-O paint with your group. Simply use one or two boxes of red Jell-O and add a small amount of water to obtain a malleable texture. Use one of educatall.com's coloring pages or a white sheet of paper for extra creativity and let children paint using their fingers. Some children will be tempted to taste the paint!